Watch This offers TV and movie recommendations inspired by new releases or premieres, or occasionally our own inscrutable whims. With The Last O.G. settling in on TBS and FX’s Legion returning from the astral plane for season two, we’re taking a look at some of our favorite TV homecomings. As a child, I couldn’t watch Roseanne. Every time I turned it on it felt like everyone onscreen was yelling at each other, or dumping on other people not in the room, or just generally being loud and unpleasant. The grown-ups said awful things about their kids and each other, the kids acted like jerks, and nobody seemed very happy without also needing to put others down. I thought it was mean and crude, and not in a fun way. It felt all too plausibly real, and it didn’t make me want to laugh. It made me want to run away, the same way I would avoid loud mean people in everyday life. It wasn’t until I was older that I was finally able to see the caring behind the cruelty. When you’re young, you tend to take things at face value. If someone says, “Shut up, you idiot,” all you hear is the order and the insult. 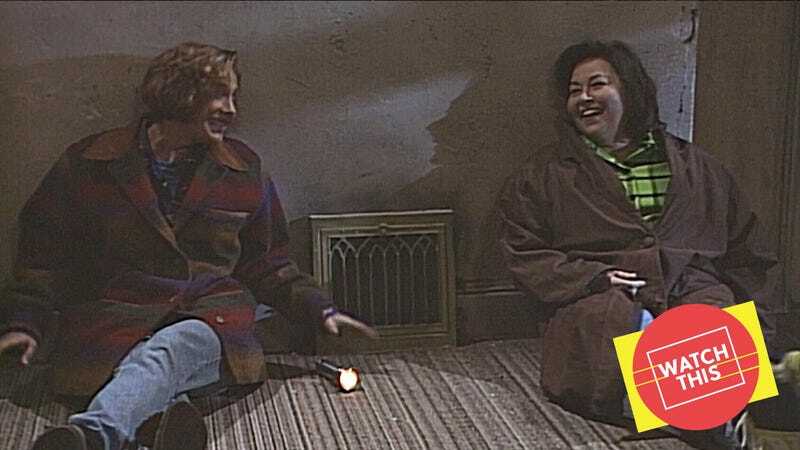 But returning to the sitcom as an adult, the most noticeable thing about Roseanne was the doubled and tripled layers of meaning that suffuse so much of the dialogue. A snippy “I hate you” also meant “I’m hurt,” and “This situation is uncomfortable”—and, often as not, the exact opposite, “I love you.” Sure, it’s an all-too-rare blunt look at working-class life and economic woes, and yes, the wit is incisive and lacerating, especially during the show’s first five seasons before things started to get meta, a.k.a. the “second Becky” era. But just as it took some years of distance and maturity for me to look past the surface-level mean-spiritedness and see the warm drama underneath, so too do Roseanne’s protagonists continuously grapple with the turmoil beneath the aw-shucks, “we’re just folks” history of their family, and reassess the dark and complicated relationships that defined them. This is never more apparent than in “This Old House,” a fourth-season installment that sees sisters Roseanne (Roseanne Barr) and Jackie (Laurie Metcalf) return to their soon-to-be-demolished childhood home, and confront some emotional ghosts in the process. Just like the series itself, what begins as good-natured ribbing and comical memories of their youth (along with Jackie clumsily trying to draw parallels between Roseanne’s juvenile misdeeds and daughter Darlene’s current behavior) soon curdles into something more honest—and painful. The episode captures an essential truth, one the series returns to constantly throughout its run: It’s not just that we each contain multitudes, and seemingly mean or brusque expressions of our feelings and beliefs will always have numerous more complicated and heartfelt layers waiting to be sifted through. It’s that each individual layer, each aspect of our personalities, also has multiple meanings, and that anything changes depending on how you look at it. To quote Jackie after Roseanne notes that their screwed-up family probably explains why she’s fat and Jackie can’t maintain a relationship: “Or, I just haven’t met the right guy, and you’ve never met the wrong doughnut.” Everything can also mean something else—even a good joke.